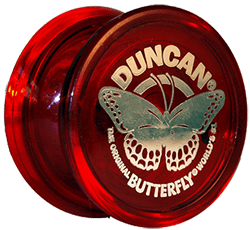 When people think of the yo-yo they often view it as the creation of Donald Duncan. The yo-yo, however, has existed for thousands of years. Ancient Greek artwork displayed the spool-like toy and over the years, the yo-yo has been found in various forms in many cultures. These early versions were made of wood, metal or terra cot and were often decorated with painting of people or scenes. The two discs were connected by a small rod in the middle and had a piece of string tied to the rod. As it passed from culture to culture, the toy went by many names: “bandalore” and “quiz” in Great Britain, “incroyable”, “l’emigrette” and “coblentz” in France, and “disc” in Greece. In the Philippines, however, it was labeled “yo-yo” which means “comeback.” As well as a toy, the yo-yo had been used for hundreds of years as a weapon, often with blades attached. The attacker would hide in a tree and sling it down to strike an unsuspecting victim walking below. In 1929, Donald F. Duncan purchased the rights to the toy from Flores and set out to market the yo-yo as America’s favorite toy. Duncan was certainly no stranger to successful marketing a product. Duncan was the inventor of the Eskimo Pie ice cream, the founder of the Good Humor Ice Cream franchise, and the creator of the parking meters among other things. Duncan imported a number of teenagers from the Philippines to demonstrate the toy and numerous tricks and stunts to the American public. His marketing worked and quickly his toy (which he called the “O-Boy Yo-yo Top”) was a bestseller. It sold three million units in Philadelphia alone during a month in 1931.